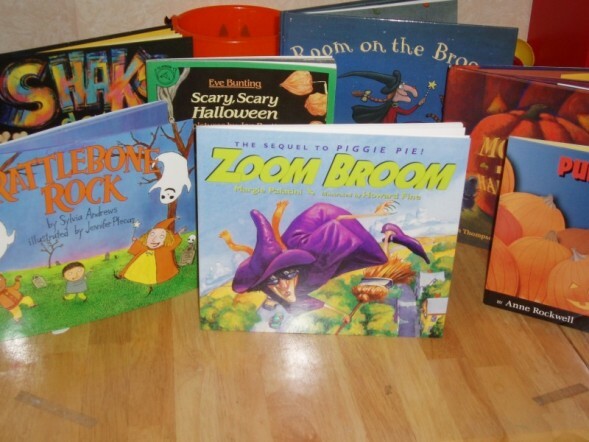 Great Halloween & FALL Books To Read To Your Class! TEACHING HEART SHARES Printables and Ideas to match some of the best reads of the season!!! Below are some of my favorite books to read to students during the month of October! I have included activities & printables that match some of the books. Spookly Maze, Word Game, and Word Search Activity Sheets! Other ideas: Pick out rhyming words in the story. Talk about shapes, sizes, and colors. Patterns with different colored pumpkins. Compare and contrast the movie and the book. They are quite different! Here's a super easy treat to share after reading the book. Spookly Marshmallow treats! Just dip the mallows in orange candy coating and top with a green tick-tac. 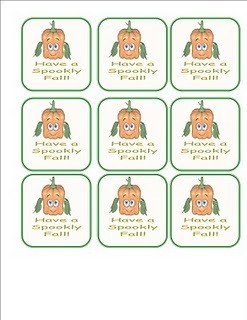 Attach this printable to your treat and you are ready to hand out Spookly! My kids love the Halloween story, Room on The Broom. It is about a friendly witch that has knack for losing things. Still she always finds what she has lost with a help from a friend. In return for finding what she has lost, the witch always lets the finder hop on for a ride on her broom. From a parents prospective, I love how this book teaches that acts of kindness only do you good. Towards the end of the story the witches broom breaks and she finds herself facing off with a Dragon. Luckily with the help of her friends she is saved from the Dragon. The witch then does a spell that makes a new broom... Her old broom was a junker and this broom is a Limo of Brooms. From an educators point of view... this book is awesome: it has lots of rhyming and lots of repetition. It is a great story for retelling too. Click the link for two videos that show two ways I have used the book. This is a great book for a parent to share at a Halloween party. The first video shows how I introduce the book to my kids or my students. The second shows how I create a magic spell like the witch did in the story. The kids LOVE this part and really think it is magic! Lots of fun... All you need is a cauldron, black construction paper, pictures of a Lily, cone, bone, and twig, and a spoon. You will also need a treat to appear at the end. These broom pens would be my first choice... but you can do pencils or you can some sort of fruit snack. I suggest you place all of the treats in a gallon sized ziploc bag. This way you can pull them out all at once after you say the spell. Write the following vocabulary words on green leaf cutouts. Cut out a large pumpkin to post in the room. Attach the labeled leaf cutouts around the pumkin. Discuss the words with your class. Make a word search with these words. Think of different places that the seed packet in the story could of come from. Have you ever planted anything before? What steps did you follow to plant? Have you ever gone to a pumpkin patch before? What are pumpkins used for? Brainstorm with you class the steps used in the story to grow a pumpkin. Write each step onto sentence strips. Next, sequence the steps with you class. Use this as a sequence center. The story began with a pack of seeds and one seed. 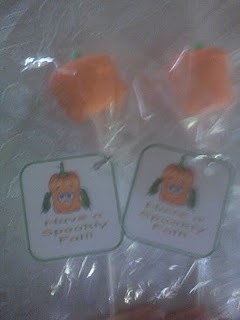 Provide the class with many different pumpkin seed packets. Have the students read the packet looking for the words pumpkin and seeds. Have them highlight words that describe the type of pumpkin. Have them design their own seed packet out of a small envelope. Look at the cover of the book. The pumpkin patch may of been just on of the many things grown in this large garden. Have students brainstorm what other kinds of seeds could of been planted there. Then have each studemt choose a kind of seed to write about. You may wish them to start their sentences with; "I planted a _______ seed and it grew into a ________." Next have the students add to the sentence or just keep the one sentences and add it to a piece of art paper and then draw an illustration to match. Carve a pumkin with you class. Give each student several seeds and have them create a pumpkin out of seeds on yellow construction paper. Fold sheet of paper into fourths. 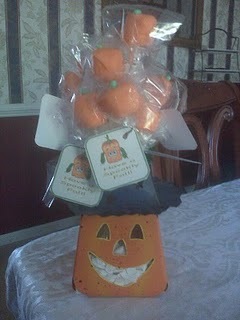 Three free printables to match BIG PUMPKIN!!!! 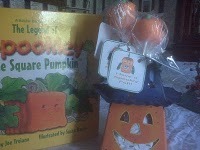 Big Pumpkin is a fun Halloween story about a witchs big pumpkin and the creatures that try to help her pick it. It has a fun, repetitious rhyme and a cute message about the importance of working together. The Witch Planted a Seed. The Pumpkin Grew like a Weed. It grew and almost touched the sky. The witch wanted to make some pumpkin pie. But it was too big for her to pull off the vine. No luck, and the witch sighed. He saved the day just like that. Working together is so much better! Then I created a cut up sheet. Students can cut out each sentence a glue it to another sheet to make their own poem. Or have them copy the poem into their poem journal and illustrate. Have children highlight the words that rhyme in the poem. Click here to print the cut-up. 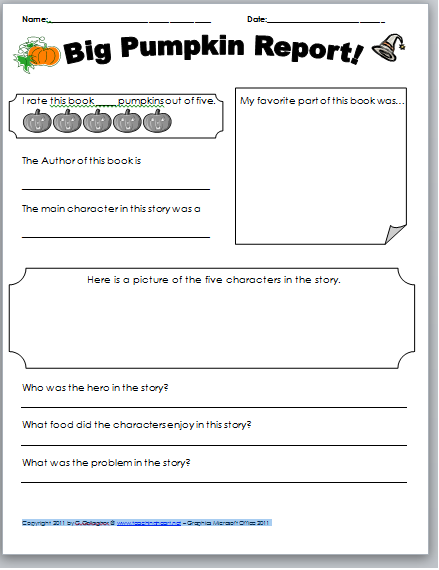 Big Pumpkin Report: Fill this out after students read the book in small groups or as a class. Independently for grades 2-3. Click here to print the report. Here is a book report for PreK-First. Click here to dowload. Need more pumpkin themed ideas??? 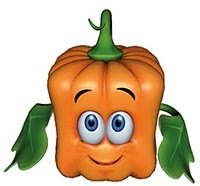 A must see page on Teaching Heart is the pumpkin page, it is filled with ideas that would go along marvelously with this great BIG PUMPKIN book!!! Using the individually-wrapped packages of Dem Bones candy from Brachs, complete a sorting and graphing Math activity. Children will sort their bone candy onto the matching bone shape. Then, they will graph how many of each candy they have. Discuss the class results. Then, eat dem bones! Skeleton dog bone painting. Use assorted sizes of dog bones glued to film containers and dip them into white paint. Print the bones onto black construction paper to make a skeleton. Have a pre-made skull and pelvis. Look at the cover and title and have the students predict what the story is going to be about. On the cover is a picture of a house. Have the students come up with ideas of who they think may live there. What do they think the people are like based on the picture of the house? Plan a series of hiding places so that a toy mouse will be found in the last one. Then, on idex cards write shoret descriptive phrases (modeled after those in the story) to lead in order from one hiding place to the other. One phrase clue may be, On a white, white board. Help the students in reading the cards and following the trail to locate the mouse. Make four house patterns all the same size for each student. Put each one on a different color of construction paper. Draw a door on each house and have the students cut out each door on their four house. Then glue the houses together so that the students can open the many doors. Give each student some art paper and have them creat their own dark house with a dark background. When the drawing is done, have the students write a description of their house. The younger ones may choose to use this sentence; "This is ______ 's mystery house. It looks ____________. It has ______________________. ________ likes it because it is ______." After the descriptions and artwork are complete, place them on a bulletin board with a moon and several star cutouts. 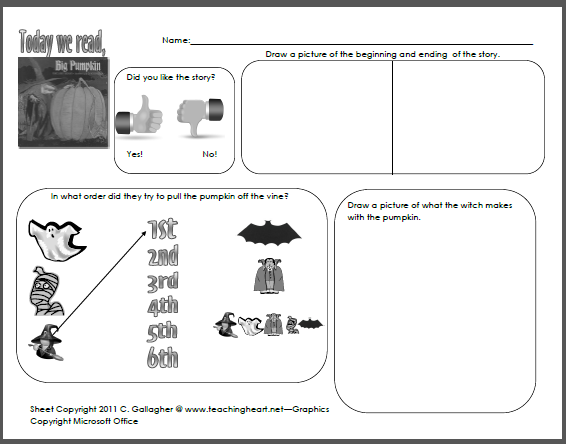 Teaching Heart Store - Printables Galore that meet standards!!! Discuss what was in the houses. Make a list, labeling each thing as "fact" or "fantasy". Have each student draw a haunted house. Give the student the writing prompt, "In a haunted house I can see..."
Write the following words on bone cutouts. Get a plastic cauldron or pot from a craft store. To introduce the story remove one bone from the pot. Have a student read the word and other volunteer to tell you the meaning of the word. After you have used this to introduce the story, place the cauldron at a center with blank bone cutouts, markers, and a copy of the book. Have the students write other words from the story on the bones and place them in the cauldron. Later make a cutout of a large cauldron and put it on a bulletin board. Then place the bones on the bulletin board around the cauldron. Asked the class to volunteer times when they were afraid of something. Looking at the cover of the book what does the class think the story will be about? When you eat turkey, what does your mom or dad use the bones for? The women had enough of the voice asking her for the bone. So she just finally gave it up. Brainstorm other things that the women could of done. Place the ideas on sentence strips. Then, have the class vote on their favorite suggestion. Reread the story with the new ending. Click for a lesson to match the book! Buy a large class pumpkin. Have the children guess how big the circumference of the pumpkin is by showing you where to cut a piece of string off from a spool. Then measure the string around the circumference and place the string on a paper that has space for guesses that are too big, too small, just right. The children can hug the pumpkin to help them. You alsomay want them to guess the weight of the pumpkin. Have them weigh the pumpkin. Sometimes someone may say they are not afraid. Still, their fear can be shown in other ways. Reexamine the pictures of the old lady. Have youngsters point out how her body language changes throughout the story. Have student take turns acting out scary expressions and expressions that show they are not scared. Have the students recreate the scarecrow at the end of the story by making their own scarecrow. Make two pumpkins of the same size on orange construction paper. Give each student the a piece of construction paper with the two pumpkins on it. 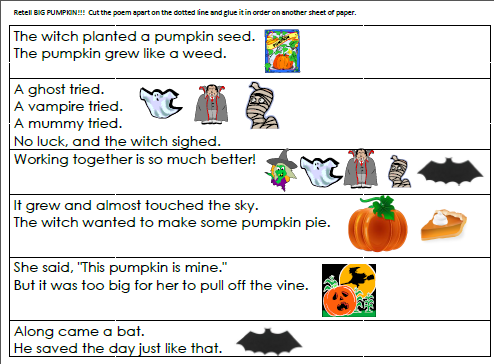 Have them write a sentence on the first pumpkin that starts out, "I'm not afraid of..." One the next pumpkin have them write, "But, I think I would run if..."
Here is a free activity sheet to print and use after reading the story. Great way to review the story with your class. Click here to download the file from Teaching HEart!!! Purchase skeleton candy from Amazon.com . In the bags you will find sugar flavored skulls, ribs, bones, and feet. After reading the above books, pass out the candy and have you students do this graph sheet! After they have completed the graph, have them switch with a friend. Have the friend answer the questions at the bottom of the graph. When I taught in a K-3 resource room. I had each grade graph their entire groups candy. Each colored dot represents a grade level. We used the large graph seen here to decide which grade had the most of certain bones or how many total each grade had. Then we hung the graph and placed our finished graphs around the large graph. Before reading the story make a Humbug Witch. As read the story use flannel-board pieces to tell the story. The kids love to watch the pieces of the witch come off to show a little girl underneath! Use a black plastic pot to as the cauldron. Then add vampire teeth (candy corn), polar bear toes (miniature marshmallows), fried bat wings (frosted flakes), lizard eyes (M&M's), and rat brains (peanuts). Allow each child to stir the mixture! Need Halloween Lessons? Follow the LINK! Want to know when we update with even more book ideas and free printables? Get on our blog mailing list. Go here to do that!